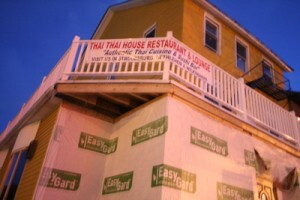 The now-named Thai Thai House in Emmaus that we reported on previously is going to open in 3-4 weeks. I stopped by yesterday and there looks to be some cosmetic work to do but things seem to be shaping up nicely. Not noted in the Retail Watch or anywhere else is the interesting fact that the Emmaus spot will have a liquor license. The Bethlehem location is BYOB only. Lots of whites to cut through the spice, we presume. The other was that Tika’s will be converted into Tapas on Main by new owners. The same group that owns Pacifico in the Promenade Shops and a host of other spots around the Northeast will be expanding their portfolio with the Bethlehem spot. In past years it was named Tortilla Flat and closed following a highly publicized food contamination that left about 30 people sick. Afterwards it transformed into Tika’s a restaurant with a smart interior, craft beer, and tasty bites (like hamburgers with pulled pork piled on top). Hopefully the new owners can keep up the awesomeness that Tika’s brought to that location. And last, but not least, is something from Philadelphia but with local ties. The Farmer’s Cabinet opened up down in Philly yesterday combining Victorian and European flairs with cocktails, craft beer, and rustic food. The same team that owns Tap and Table, The Bookstore, Atlantic Jazzyard, and Fork & Barrel own this spot. Could this mean their other property, Bahnhof, will finally get worked on? It was supposed to open in October last year after Musikfest but never materialized. An unconfirmed source told us that the project was rushed to open and so much so that long-time employee and GM of their openings, Ben Miosi, walked off the job. As of March 9th he was still with the company according to a press release emailed to various Philly food blogs. Will this push the future Bethlehem German beer bar further back in development? We sure as hell hope not. A new steakhouse in Whitehall and a new eatery in Coplay are in the works for the Lehigh Valley restaurant scene. This is something I’ve been waiting for….the announcement of venue changes for Musikfest. I was skeptical about many things: more paid venues, no more fest on Main Street, crappy transportation between SouthSide and North Side, and a few other minor things. I’m pleased to find out that my concerns were unfounded.